Divine Healing Hands Soul Healers join DHH Guide Linda Hamilton in Lanham, Maryland for a workshop on using the Divine Healing Hands treasures. 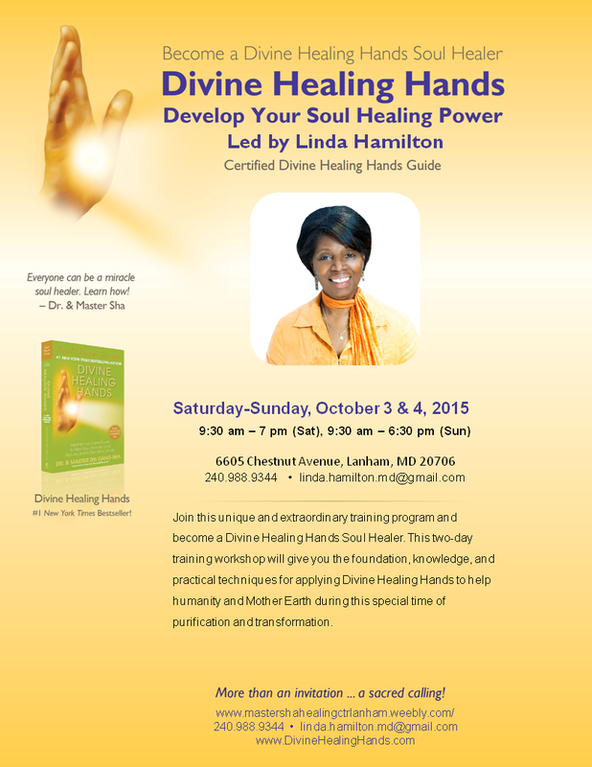 People interested in finding out more about becoming a Divine Healing Hands Soul Healer are welcomed to join. Learn how to use your Divine Pendulum to detect what is true and what is false. Learn more about the key foundational practices for self healing, rejuvenation, and longevity. Practice self-, group- and remote- healing on ourselves, each other and remotely to our loved ones. Practice makes perfect! Get answers to questions you might have about your healing practices. Find out about changes in Master Sha's Divine Healing Hands program. Connect with Master William and Master Alma remotely for a blessing from the Divine Channels.